She may count Tom Ford, Versace and Balmain among her favorite designers, but Kristin Cavallari’s new jewelry line, inspired by her daughter Saylor James, is decidedly affordable. Called Uncommon James (“Because James is an uncommon name for a girl,” Kristin tells us), the 15-piece collection is made of gold and crystal, mostly geometric pieces. Prices range from $42 to $89 and include on-trend items like a thin choker and ear cuffs. This isn’t Kristin’s first foray into accessories. In 2014, she launched jewelry line Emerald Duv with her friend Chelsea Bulte (she left the company in January to pursue her solo venture) and has been designing a range of shoes for four years, but Kristin says this is her most personal venture to date. We chatted with the mother of three to find out more about the new range, her summer plans and goals she still hopes to achieve. 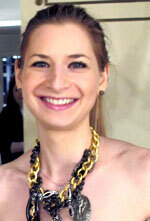 theFashionSpot: What inspired you to become a jewelry designer? Kristin Cavallari: I love designing accessories because I really think they can make or break your outfit. I’ve had my shoe line for four years and have loved every minute of that, so jewelry seemed like the next natural step. tFS: What is it about your daughter that inspired you to name the line after her? KC: I just love the name James for a girl (even though it’s uncommon! ), but more than that, having a girl is the best — it’s a different bond than I have with my boys. tFS: Your jewelry is very affordable, how important was this to you? KC: Very! The modern woman doesn’t want to spend a fortune on accessories and you don’t have to to achieve great style. tFS: Any career goals you would still like to achieve? KC: I would still love to produce a reality show and have a home goods line. tFS: Can you tell us about some of your favorite designers? KC: I love Tom Ford, Versace, Balmain. For every day, I like Frame Denim, Mason, L’Agence, A.L.C. and IRO. tFS: Any fashion items you’re dying to splurge on? KC: Actually, no! I know that’s crazy, but there’s nothing I have my eye on at the moment. tFS: Prior to Laguna Beach and The Hills, what were your career dreams? KC: I loved the idea of being in media, but didn’t think it was a realistic goal. I also thought maybe I would be an interior decorator. tFS: What are you most excited about for Summer 2017? KC: Just being with my family! I have my sister-in-law’s wedding, but other than that, I don’t have a ton of plans, which is very nice and refreshing for me. I’m looking forward to just being home and relaxing mostly.